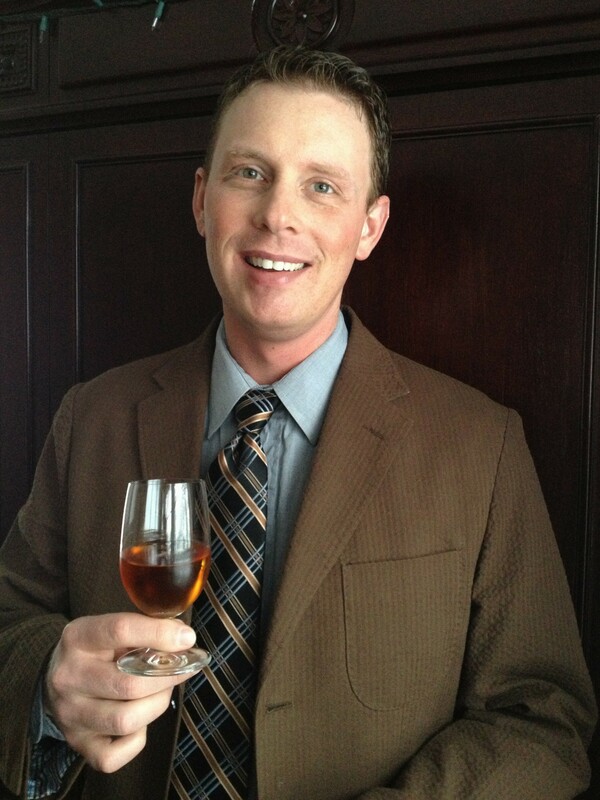 I created this recipe for Woodford Reserve’s The Art of Summer Culinary Cocktails class. You can find my rationale here. Instead of making one flavor/recipe of bitters, this method lets you experiment to your heart’s content with different combinations and ingredient balances. There’s actually no reason to stop at twelve jars; you could easily create a huge set of base extracts to draw on. 4 oz for each item is enough for most people but if you’re really into it you could move up to full cup jars. You must use a vodka in the 100 to 140 proof range. An extract – which is what you’re making twelve of – is a liquid which contains dissolved molecules, usually congeners. Technically, that’s called a solution. There are three types of molecule solubility in the culinary world: water, alcohol and fat. That is to say that the flavors from your ingredients will be extracted by one of those fluids. Water and alcohol are our primary concerns here*. Many of the flavors that we want to coax out of their solid homes and into the liquid are limited to either water or alcohol solubility. If your base liquid has too much alcohol or too much water you’ll be limiting what flavors you can extract from the ingredients. Also, there are a few more temperamental flavors which don’t like base liquids where the water content exceeds the alcohol. And finally you ideally want a vodka with as little flavor as possible so as not to influence the flavor of your final creation. Q: But what about using bourbon or rye? I’ve heard a lot of people say you should only use those. A: You can definitely use those. They can impart a wonderful flavor and nuance to your bitters. Just be sure you follow the 100 to 140 proof rule. Think of alternate spirits as advanced bittering. No reason to stop with those liquors, either – rum and tequila can make great bitters, too. There are three categories of ingredients in bitters: bittering agents, fruits, and spices & herbs**. The ratio and balance (or omission) of the ingredients creates the broad categories and unique flavors of different bitters. Bitter has to be the least represented flavor in the modern American diet and I, for one, welcome its return. Bitter is not necessarily a good flavor by itself but it has a wonderful property of enhancing and complimenting other flavors. Try making a manhattan and omitting the bitters and you’ll see what I mean. You actually only need one bittering agent to make bitters. I use four because there are four traditional ones to use and because I think more things to play with is more fun. The list here is meant to be just a springboard. These represent the most common fruits found in bitters but please let your experimentation roam wild. Just make sure that your fruit solids are free of pith and seeds and are dried thoroughly. Slowly drying them yourself is best – commercial dried fruits are dried under rather abusive conditions that sometimes destroy the flavors that you are after. I use a cheap fan and low-heat style food dehydrator. There are so many foods in this category that you can use that I don’t even want to begin listing them. These are a good place to start. Couldn’t help myself: What about cinnamon, nutmeg, allspice and clove for a Christmas bitter? Or apple and cinnamon for an apple pie bitter? Or maybe a strongly-flavored ginger bitter? I hope it’s obvious to you by now where this is going. Each jar gets one solid ingredient. Fill to the top with vodka. Label with ingredient name and approximate time to remove the solid matter. 12 extracts as the base for the bitters. date to begin checking for done-ness. Entirely unnecessarily color-coded by type. would be done at about the same time. 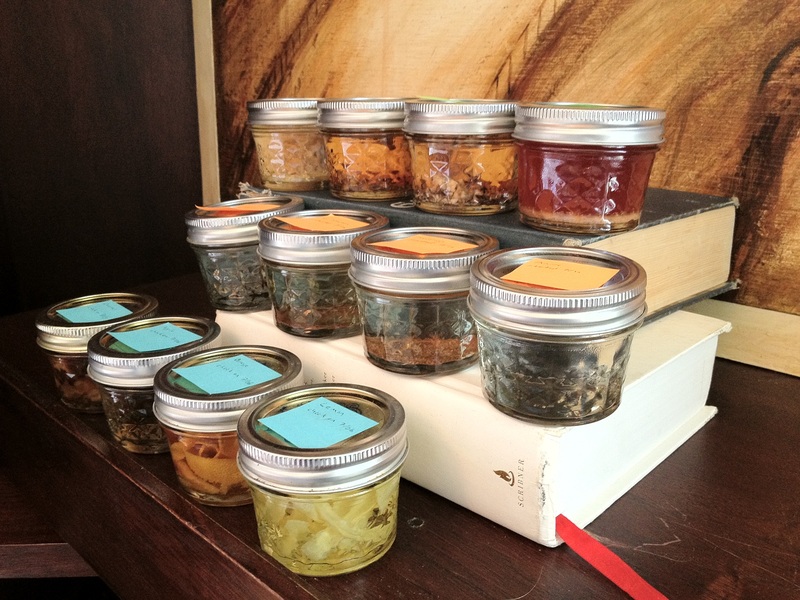 Let your jars rest at room temperature until the appointed time. Check the flavor. Does it taste strongly of the ingredient? If not, let it rest for a few more days. If so, strain out the solids – you’ve got an extract ready to use! Very often you can tell just by looking. If the solids have sunk to the bottom and/or turned white, they’re probably done extracting. If your solids appear to be fully extracted but the flavor isn’t what you want, just strain them out, add some more solids and start the process over again. For the impatient ones: you can effectively reduce the extraction time by half by doubling the amount of solid ingredients that you use. There will be some subtle flavor differences versus a longer extraction time but it won’t be noticeable by most people. Here’s the hard part. Now that you have all your extracts ready to use, you can start blending. I have some recipes here to get you started. I recommend blending into a dropper bottle. Bitters are potent – you want to be sure you are careful in your final application. Also, dropper bottles are small so you can have a whole bunch of different flavored bitters and take up very little space. 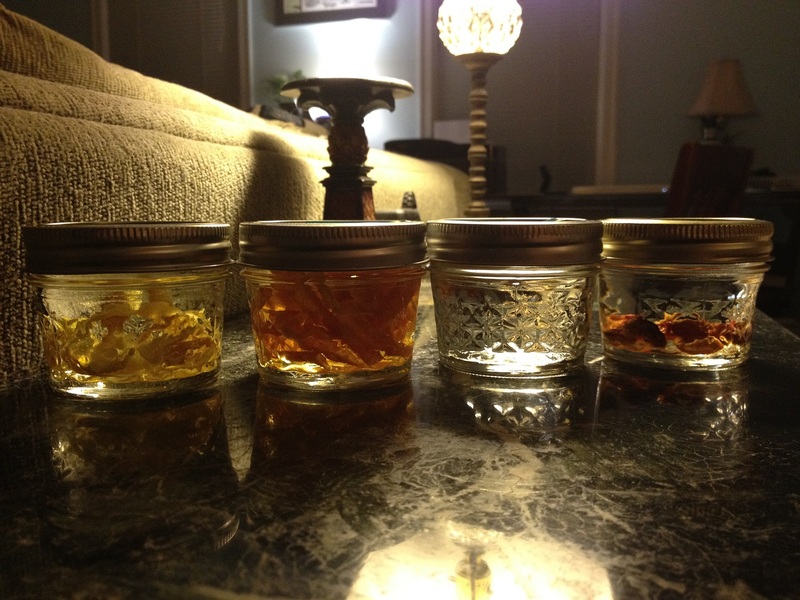 Your bitters will need a final round of resting before their flavors will get fully melded together. Try sampling them freshly mixed and at weekly intervals and you’ll see a subtle but noticeable change. This change will wane over a few weeks to a few months as the flavors settle together. Cocktails are the obvious and historic choice for using bitters. Umpteen variations on the manhattan use differently-flavored bitters. I’m fond of using bitters in gin drinks, too to add depth that the gin doesn’t bring on its own. A cola-based highball can also benefit from bitters to balance against its sweet and sour flavors. This recipe uses orange bitters. It is entirely possible to end-run this entire process, buy all of your flavor elements as extracts and jump straight to blending. You can even find bitters extracts on-line. But you lose the control of sourcing your own ingredients, drying your own fruits, etc. Plus the DIY way is a lot more fun (and a lot less expensive). If you found this guide helpful, please let me know. I’d love to get your feedback and post any bitters recipes that you’ve concocted. Feel free to leave comments below or I can be reached via contact form or on Facebook. * Can’t think of a fat-based culinary extract? How about garlic-infused olive oil? ** I hear you Mr. Stickler-For-Accuracy. That’s technically four categories. But I’m counting them based upon their complementary flavor profile and uses. Neh. *** Except maybe some desserts and other sweet sweets. Bitters tend to lend themselves to savories. Apply the sniff test before dripping your bitters and you can get a sense of whether or not they’ll work with your food item. Just whipped this up at the request of Seth Thompson of the Bourbon Review to promote our upcoming Summer Cocktails Class. Stir over ice, strain into a martini glass. Garnish with a maraschino-soaked blackberry.